Platforms - a spring board for Closed-end Funds? Given the regulatory changes that are underway, platforms are going to play an increasingly important role for investors and their advisers. Patrick will take a look at how advisers can use platforms to research and buy closed-end funds on behalf of their clients. He’ll investigate the transition from Investment Trust Savings Schemes to wrap platforms and look at the very first and original unbundled fund investment. He’ll also discuss adviser remuneration options and the challenges platforms must overcome to implement these. 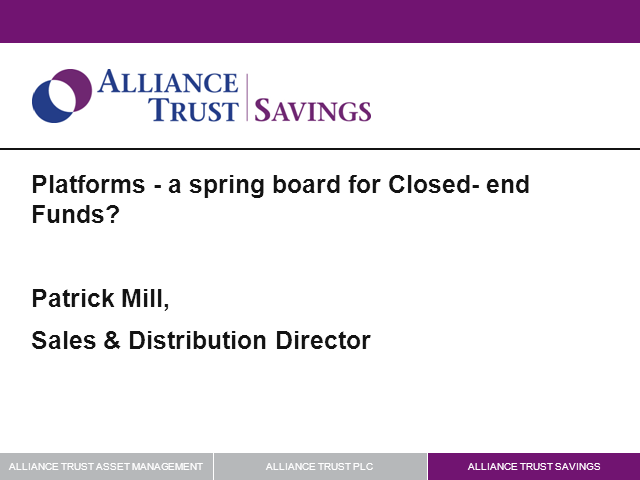 Title: Platforms - a spring board for Closed-end Funds?